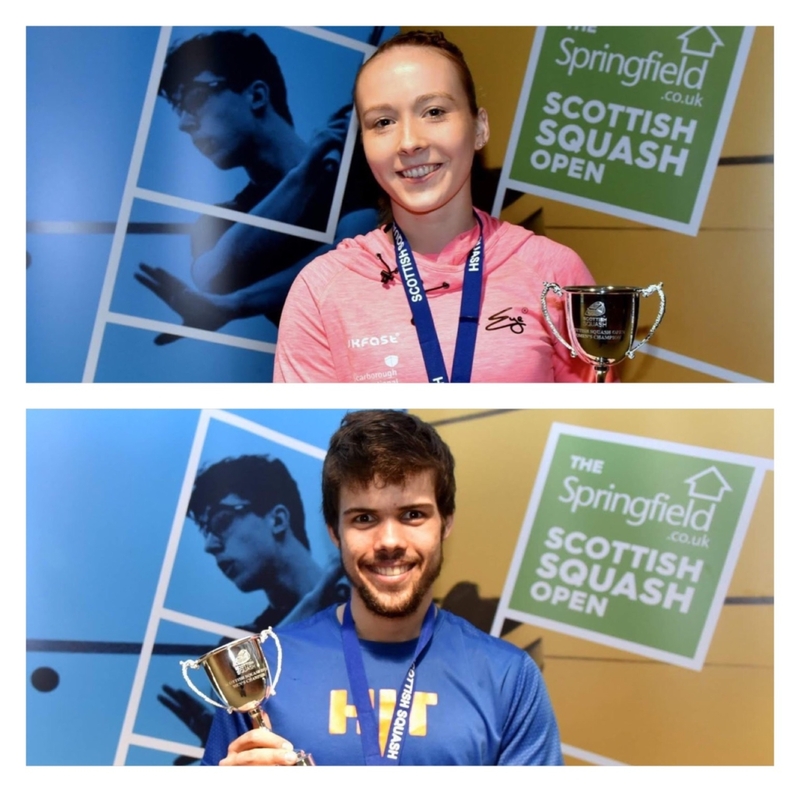 The first Scottish Open champions to be crowned in 18 years came from England (Ladies top seed Lucy Turmel) and Spain (Men’s second seed Edmon Lopez) but the 2019 Springfield Scottish Squash Open provided plenty of positives for the competing Scots last week. 2019 Springfield Scottish Open Champions Lucy Turmel and Edmon Lopez. Mark Ridgway OBE, CEO of event partner Craven Fawcett, with Men’s Champion Edmon Lopez. 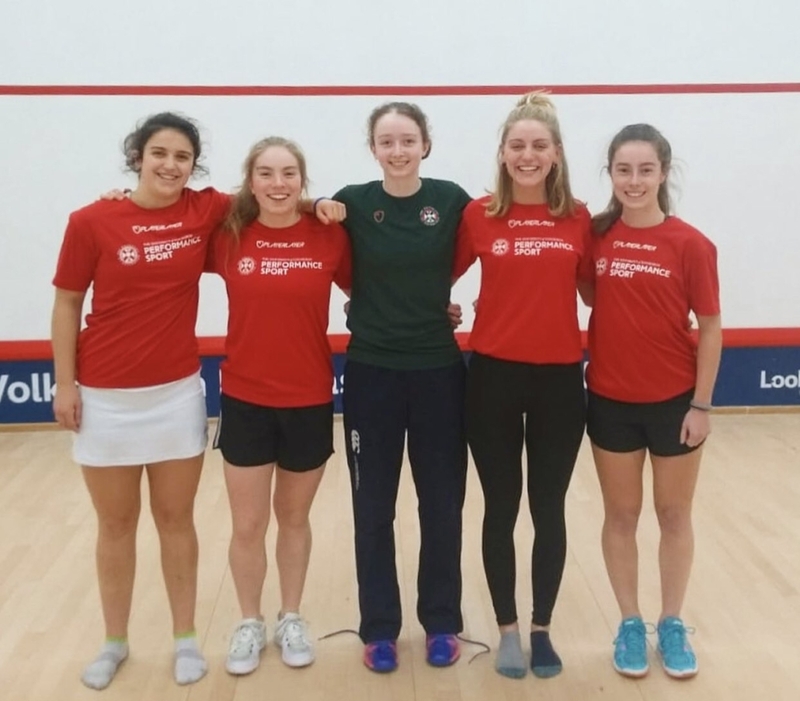 A total of nine Scots took part in the tournament played across five days at Oriam; Scotland’s Sports Performance Centre, in Edinburgh (April 3-7). 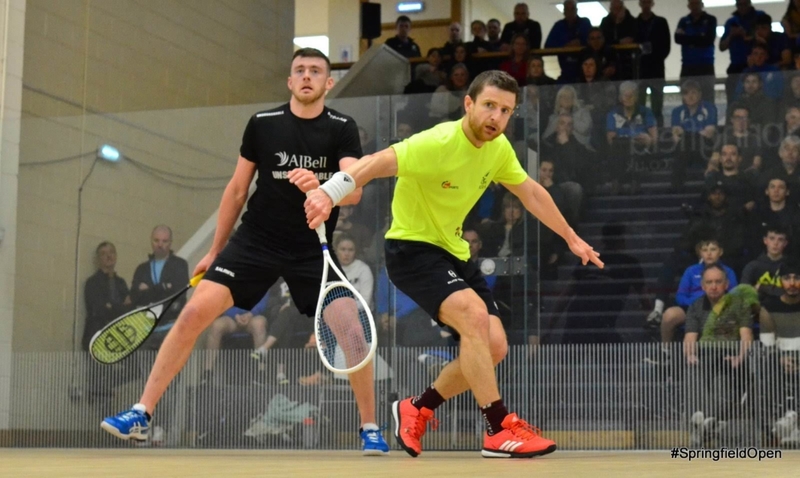 In the men’s draw, top seed Alan Clyne can be proud for playing his part in a truly thrilling semi-final encounter on Saturday against England’s Patrick Rooney (7) who recovered from two-one down and 6-9 in the fifth to win 11-7, 4-11, 6-11, 11-8, 11-9 (65m). Rory Stewart continued to show his progress this season by beating 9/16 seed Miko Aijanen from Finland in round one 10-12, 11-5, 9-11, 11-3, 11-7 (70m). Rory bowed out in round two but his R1 win coupled with a quarter-final finish at the Swedish Open last month should provide a further rankings boost for the 22-year-old. 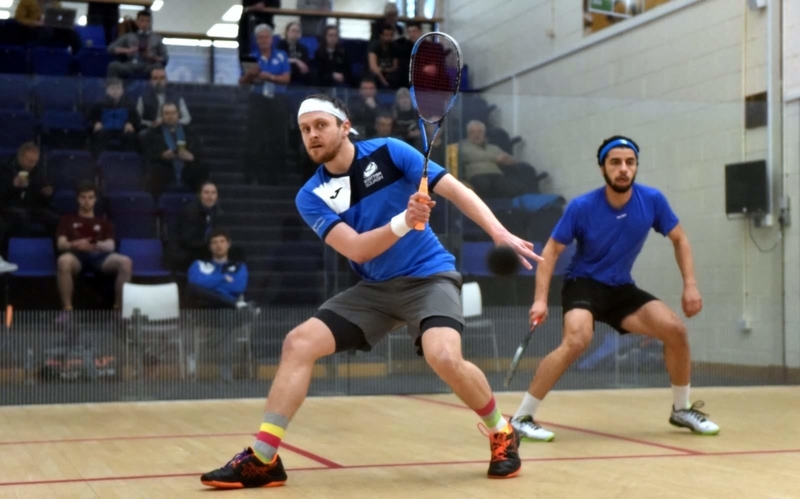 Fergus Richards had the honour of hitting the first ball of the 2019 Springfield Scottish Squash Open on the showcourt and played well in defeat against 9/16 seed Matias Tuomi of Finland, 11-6, 8-11, 11-1, 11-9 (56m). 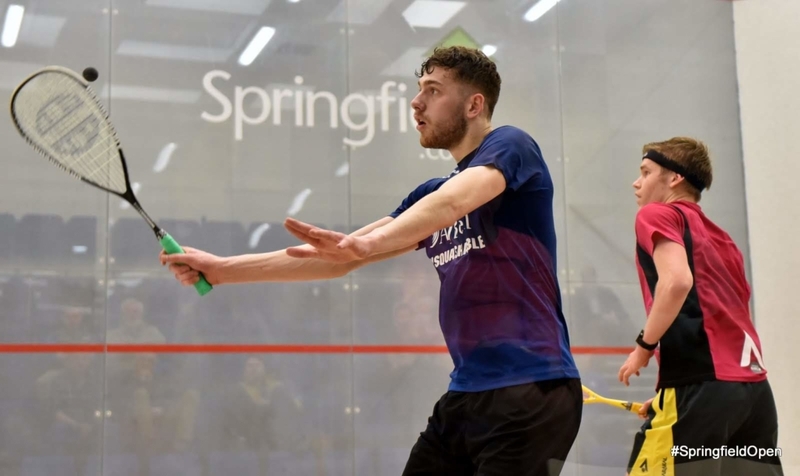 After a spell on the sidelines due to injury, Chris Leiper also got an opportunity to perform on the main court, showing his fighting spirit in a narrow 9-11, 11-3, 11-8, 11-7 (31m) defeat to Jordan’s Muhammad Alsarraj. In the women’s draw, Katriona Allen continued her breakthrough season, reaching the last 16 at Oriam. The 21-year-old shocked Finland’s 9/16 seed Riina Koskinen in round one, 8-11, 13-11, 11-4, 11-7 (31m) before a strong performance in Q/F defeat against recently crowned Swedish Open champion Kace Bartley (4) 11-9, 4-11, 11-8, 11-3 (29m). It follows Katriona’s maiden PSA title on home turf last month where she took out number one seeded Dutch player Juliette Permentier in the final at the Tayside & Fife PSA Closed Sat event in Perth. 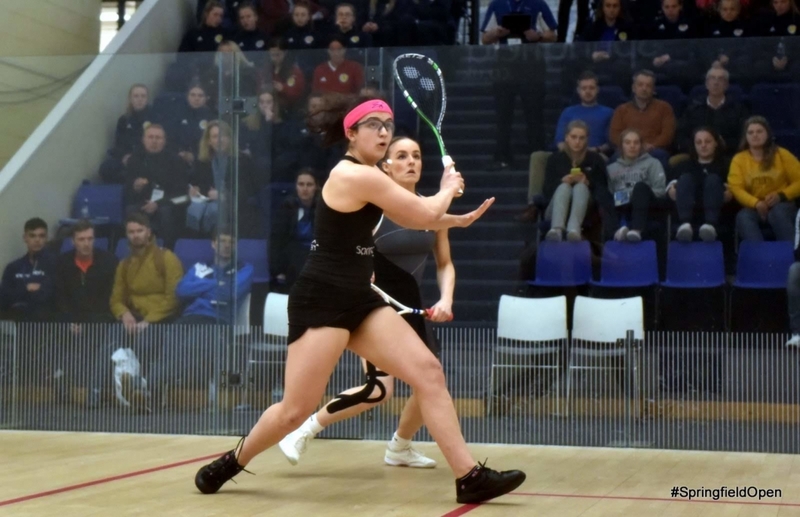 Georgia Adderley produced a dominant display in round one against 9/16 seed Alice Mead winning 11-7, 11-9, 11-2 (33m) which set up an all-Scottish clash in R2 against in-form Swedish Open finalist Alison Thomson who received a bye. 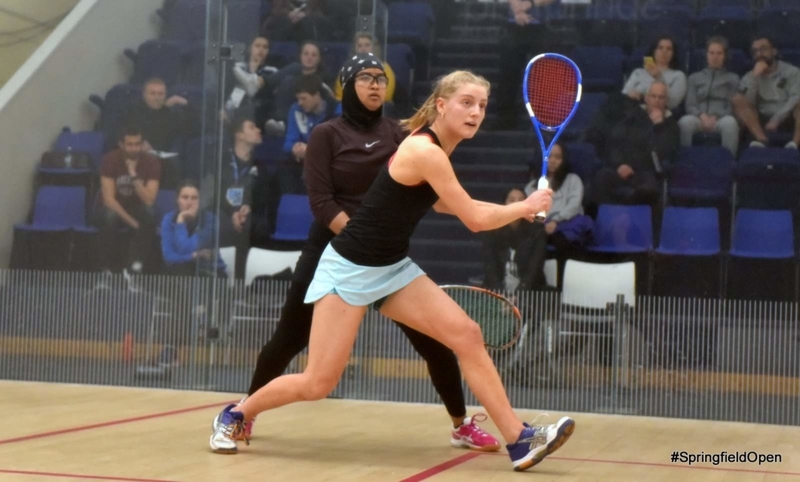 Georgia, 18, sealed a first win over Alison, seeded three, in four tense games on the showcourt, 11-5, 11-8, 8-11, 13-11 (48m) to secure a maiden PSA $10k last eight finish. Cristina Gomez, proved too strong for Georgia in their quarter-final clash winning 11-3, 11-7, 11-4 (28m). 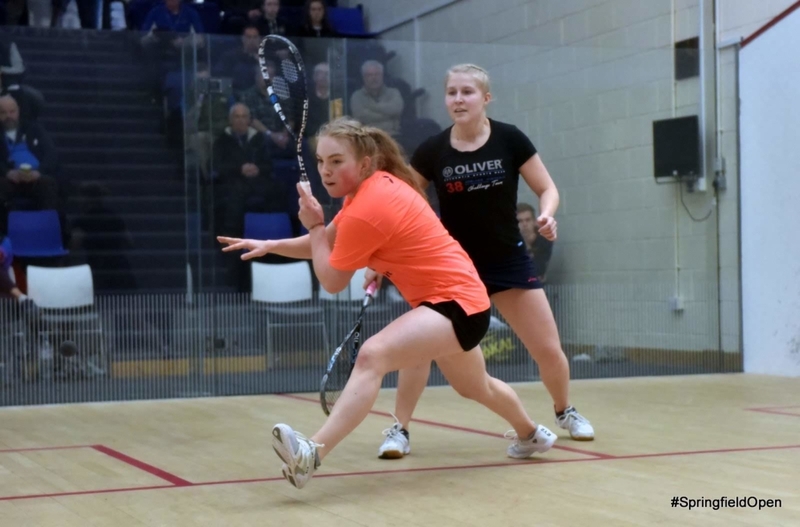 15-year-old Lucy Murchie described her Springfield Scottish Squash Open experience as ‘amazing’ and learnt a lot in defeat to England’s Jasmin Hutton (7). 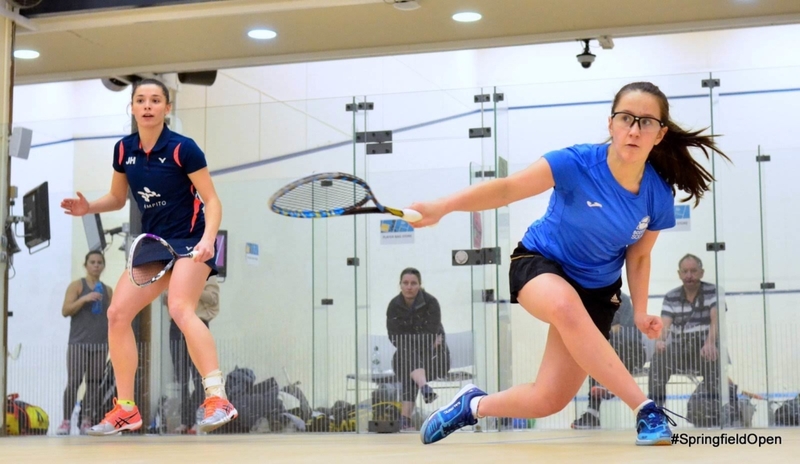 The Crieff teenager took an early lead in her opening two games against Jasmine with the world ranked 82 player eventually pulling away in all three games to earn a 11-2, 11-2, 11-2 victory. Read our extended interview with Lucy here. 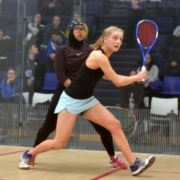 Carrie Hallam took to the showcourt on the opening day and was unfortunate not to take her match against hugely talented Aifa Azman (Mas) further than three games. 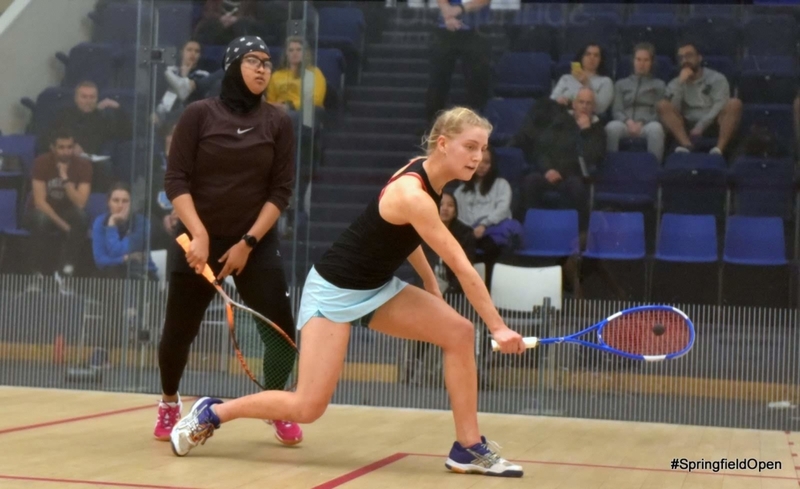 Aifa, 17, started impressively 11-1, 11-3 before the Scot got into her stride in a close third which the Malaysian won 14-12 to take the match. Carrie, who’s currently in her final year studying Neuroscience at Edinburgh University (UoE), was an invitee into this year’s event having finished fourth at the National Championships and winning silver with UoE at the recent BUCS Championships. The 2015 Commonwealth Youth Games athlete said: “To be given a spot at this event was brilliant and such an honour. 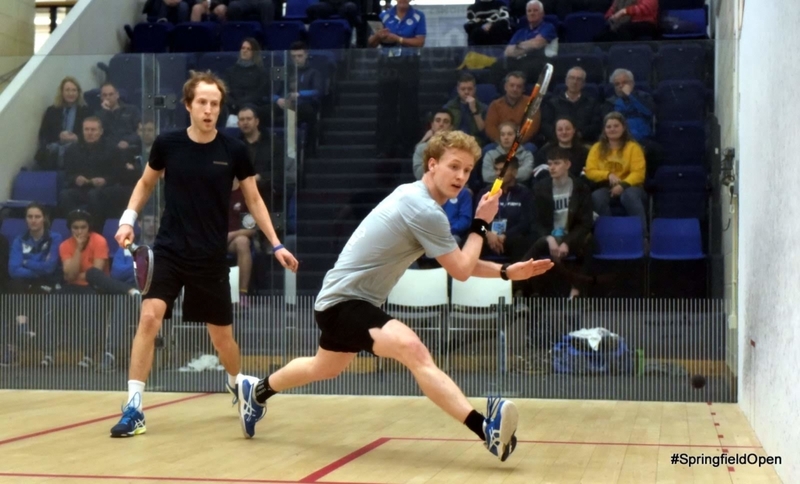 “Having the Scottish Open return is great and hopefully can further boost squash in Scotland. “It was great to have players like Alan Clyne competing and if we can attract even more of the best players moving forward then the event will just get bigger and better. “I loved competing and I’m really enjoying my squash right now. “University is quite intense with my final exams and dissertation and squash gives me that release I need. “I look forward to every training session and every match. Carrie, 21, added: “I was thrilled to finish fourth at the Nationals and the main goal at the BUCS Championships was to reach the final which our team did. UoE – BUCS Championship silver medalists. “I got to play Coline Aumard who is 34 in the world which was a great experience. Watch our 2019 Springfield Scottish Squash Open round-up above. 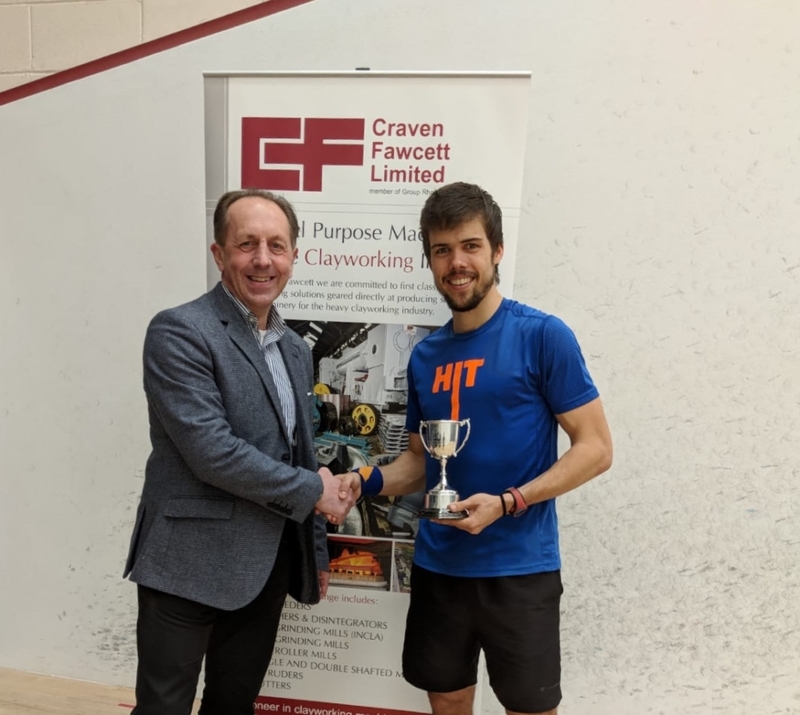 Head to the official 2019 Springfield Scottish Squash Open event website for full results, reports and images, here.